Construction sites are among America’s most dangerous workplaces. The use of heavy machinery, hazardous substances, and even inexperienced crews contribute to skyscraper-high construction site injury rates every year. While many different private and governmental entities like the Occupational Safety and Health Administration monitor worksite safety, accidents happen often. Immediately after suffering a worksite injury, victims will experience more than just physical pain and agony. IMPORTANT: Undocumented immigrant laborers who have been injured on a construction site are also entitled to recover compensation for any construction accident injury. It is common practice for employers to threaten immigrant workers with deportation if they file injury claims. Do not let anyone intimidate you before speaking with a construction site accident lawyer in NYC. Jobsite injuries often result in medical bills, insurance claims, and lost wages claims. If you have been injured in a construction site accident, you need to consult with a New York construction accident lawyer to help review your claim. With the assistance of an experienced construction accident lawyer, you can file a claim to help recover damages and make your financial burden easier. Take pictures of the accident site and your injuries as soon after the accident as possible. This will help preserve evidence on what happened. Discuss the accident with any co-worker or other witness to the accident. Make sure to take down the contact information for all witnesses. Report the incident to your employer or to the construction site foreman. Once you have reported the incident, make sure that an official report is made by your supervisor or the foreman as soon as possible. 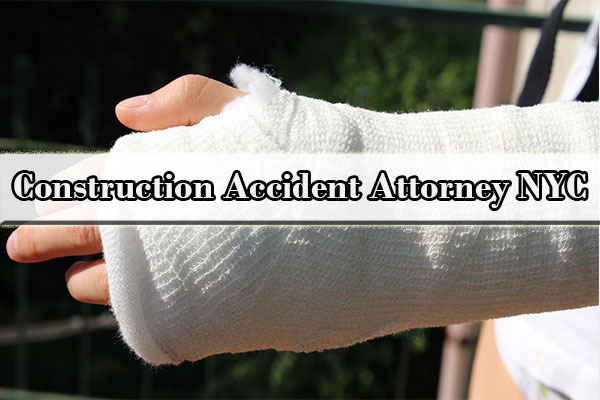 Contact an experienced construction site accident lawyer. A lawyer can help you further investigate your claim and can help you plot a strategy for seeking financial compensation in court. The Law Office of Yuriy Moshes offers free consultations to all victims of construction accidents in NYC. File an incident report with a governmental agency, such as the Occupational Safety and Health Administration (OSHA). Finally, preserve any documentation that you have of the accident and your injuries such as incident reports, witness statements, and medical bills. This evidence will help you prove your claim if you need to go to court. Once you hire an attorney, you should make certain that he or she has all of this information. Soft tissue injuries including sprains or muscle strains. Just as there are many types of construction accident injuries, there are many ways that you could be entitled to recover compensation after a construction accident in NYC. The type of claim that you have matters because it will determine both who you can sue and how you should prove your case. Any employee injured at a New York construction site while performing any portion of their daily work tasks is eligible to file a claim under the worker’s compensation system. In the worker’s compensation system, benefits are paid by your employer’s worker’s compensation insurer. These benefits include full coverage of medical costs plus a partial compensation for lost wages. The construction accident lawyers at the Law Office of Yuriy Moshes can help you better understand the compensation that you will be entitled to under the worker’s compensation system. All workers are eligible for worker’s compensation regardless of whether either you or your employer was at-fault or negligent. Worker’s compensation claimants should note that filing for worker’s compensation results in forfeiting all rights to appear in court on the same claim. In fact, if an injured employee has a valid worker’s compensation claim, that employee must file for worker’s compensation rather than file in normal court. For this reason, it is important to hire a specialized New York City construction accident lawyer to help file your claim. Under New York’s unique construction labor laws, special compensation rights exist for workers who are injured while on scaffolds or who fall from high places. Under New York Labor Law Section 240, employers and construction contractors must take special precautions when erecting and managing scaffolding. When an injury occurs, your employer may be separately liable under this law. If you have been injured on scaffolding, you should consult a construction accident attorney about your legal options. Similarly to the scaffolding claims law, the New York Labor Law Section 241 requires construction sites to meet additional safety requirements that help alert construction workers to on-site hazards. These requirements include the placement of barriers around construction elevator, PPE provisions, and slipping, falling, and tripping protections. For additional information, consult with a New York construction accident lawyer. As explained above, worker’s compensation claimants may be barred from pursuing a legal claim against their employer. However, if a third party such as another construction subcontractor, a supplier, or an equipment manufacturer was responsible for your injury, you should also consider filing a third-party accident claim. If you or a loved one becomes a victim of a construction accident in NYC but were not employed, you may still have a claim for legal compensation. Passerby, bystanders, and construction site visitors may file a personal injury lawsuit against the at-fault party for any injuries suffered at the construction site. In addition to any of the above claims, you may also be eligible to file for social security disability. Many severe construction site accidents can result in permanent injury, which may entitle you to receive disability coverage from the Social Security Administration. 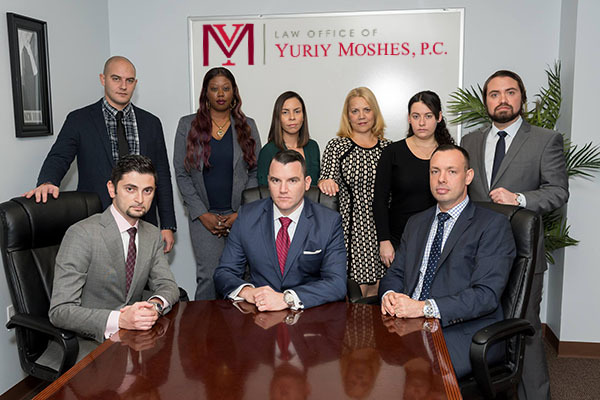 The attorneys at the Law Office of Yuriy Moshes can help walk you through the disability filing procedure. New York accident lawyers of The Law Office of Yuriy Moshes help injured workers who have become victims of construction accidents. We represent clients in the greater New York City area including all of its boroughs (Manhattan, Brooklyn, Queens, the Bronx, and Staten Island) as well as Northern New Jersey, Long Island, and upstate New York. If you have been injured at a construction site, you need an experienced construction accident attorney to help you seek justice and recover financial compensation for medical bills and lost wages. Call us for a free consultation about your legal claim today!